Elevates Screen: 4.72 - 7.87 inches above the table, which provides an optimal visual angle to help to prevent neck pain and eye stress, gives your laptop the space it needs for the air to go through to keep it cool. Adjusting laptop screen height is critical for maximum comfort and productivity. Great for Your Device-the stand holder with reasonable design can prevent your laptop/macbook/notebook computer/tablet from overheating. Easy to Carry-It is foldable and lightweight, you can take it with you everywhere. Convenient to Store-easy & quick action opens and closes the stand, and takes up very little space when closed. Simple to use-make of very durable, steady and stable materials which make the stand easy and solid to use.The rubber pads provide an optimal grip for your Laptop. Laptops, notebooks and tablets with screen sizes between 7.9and17.3 inches. This includes iPad,iPad mini,Macbook, HP, Sony, Dell, Thinkpad,Toshiba, Acer, Chrome, Samsung, Lenovo, Asus, Alienware and many other devices. ✦DURABLE AND STABLE :Made of aluminium alloy, nylon and stainless steel, premium materials make the stand holder more sturdy. 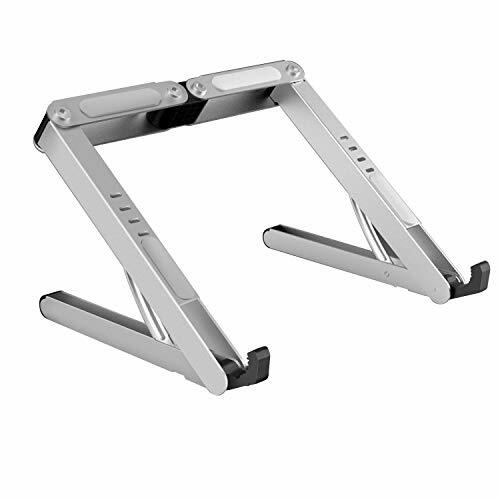 Four-point non-skid pads keep the stand stable and protects its surface once placed on. Ideal for home use, office, outdoors, traveling, schools, hotels and more. Take it with you everywhere as it is foldable and lightweight. ✦FITS ALMOST ALL MAKES AND MODELS - Fits for 7.9 inch to 17.3 inch Laptops/Notebook computers and tablet, like MacBook, iMac,iPad,iPad mini,Microsoft Surface Pro, Samsung Galaxy Tab, Notebook, ThinkPad, Lenovo, Dell, Hp and more. ✦HEIGHT&ANGLE ADJUSTABLE : 4 level djustable,Height adjustments options accord with Ergonomic design which adjust posture to help you ease pains in shoulder and waist, prevent eyestrain and even eliminate hand fatigue. ✦SUPER SMALL AND PORTABLE - Collapsible small size, Amazing construction. makes it ideal to carry in a laptop bag. you can take it to anywhere you wanna to go. ✦12-Month Warranty: Hassle free replacement or money back during the warranty.If you have any problems about the laptop stand, please contact us and we will give you a satisfied solution within 24 hours. If you have any questions about this product by Aoafun, contact us by completing and submitting the form below. If you are looking for a specif part number, please include it with your message.